Lifestyle Vouchers are the most inclusive incentive and reward solution in the market, giving customers access to some of the UK’s top retailers, cinemas, holidays and more than 16,000 dining and pub venues. With this much choice, there is something for everyone and every budget! There are so many ways to use Lifestyle, either with an eye-catching Gift Card, eVoucher or an eCode. 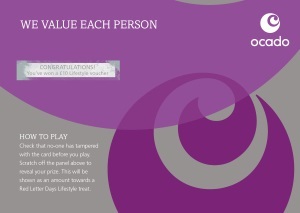 You can even use scratch cards or an online points scheme to deliver the Lifestyle Vouchers. We make things more personal by giving you the option to personalise with your company logo and a message to the recipient. Create an account and bank your voucher. Select your preferred retailer/s using your account credit. Receive a Gift Card, Gift Voucher or eCode to be used in-store or online. Go Shopping! This has been the most impressive incentive campaign that we have ever run. We smashed our initial sales target and came in over 5% above target. Overall we saw our sales increase by a whopping £1.5 million above previous years. The breadth of choice for gifts and experiences on the website is extensive and ensures that everyone’s interests are catered for. I will be spending my points on Lifestyle vouchers to buy a new sound system, but will keep my eyes peeled for experiences and future days out. The incentive programme has been very well received since its launch. It has been at the fore front of everyone’s mind and has become a part of everyday life in the contact centre. We’re thrilled with the results. We wanted a new programme that was much more closely linked to our brand and our culture. Our goal is to reward exceptional performance and the scheme we have in place has been successful in doing that. Talk to us and start something more rewarding today. Lifestyle is powered by Motivates. Your employees are the only sustainable advantage in your business, everything else can be copied. Look after your staff and they’ll look after your customers. Get this right and money looks after itself. Motivates has the potential to help your businesses solve your reward, incentive and motivation problems – from building and retaining customers, to staff motivation and ultimately improving the bottom line. We do this by providing unique solutions that are backed by first-class account handling services and an enormous portfolio of partners and venues.